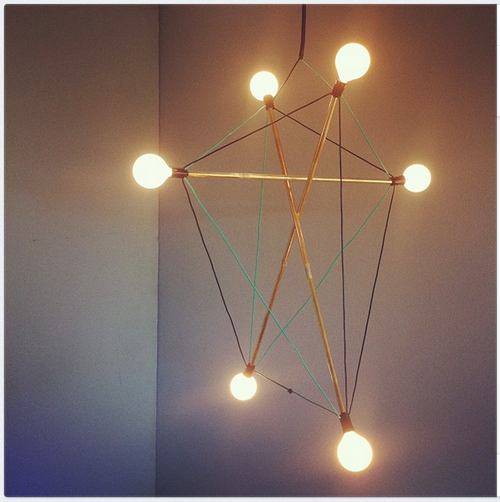 Read here about the deployment of electrical light fixtures in tensegrity structures. A light fixture (US English), light fitting (UK English), or luminaire is an electrical device used to create artificial light by use of an electric lamp. 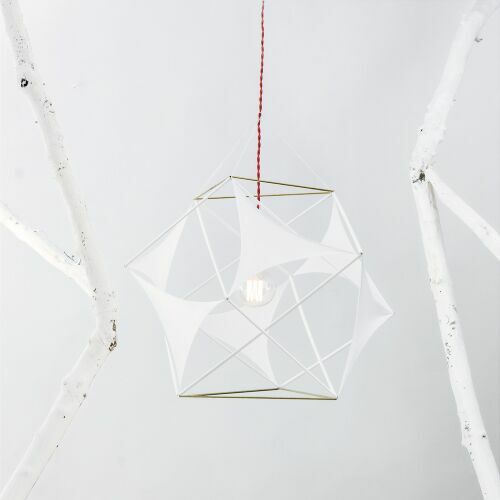 Tensegrity researchers often apply tensegrity structural thinking to the light fixture's body or reflector (shade). Fluorescent light bulbs are available in straight tubes of varying lengths. Many tensegrity modellers use these tubes as struts in tensegrity constructions. Using fluorescent tubes as struts is a special case of using glass in tensegrity structures; for more information, see glass. Shades or reflectors are highly variable and decorative, and many tensegrity researchers form the shade from a tensegrity structure. A selection of images of tensegrity structures involving light-producing elements. 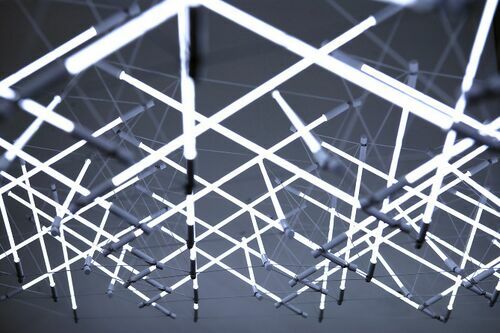 Tensegrity 3 by Branden Ravenhill." 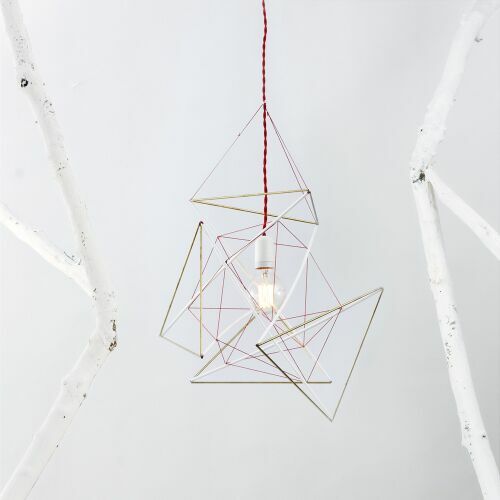 http://www.brendanravenhill.com/collections/lighting"
Michal Maciej Bartosik is an artist who has produced many tensegrity light sculptures. Below, his "Space Frame Lights." For more, see his [[Clar, James|page]] or his website. 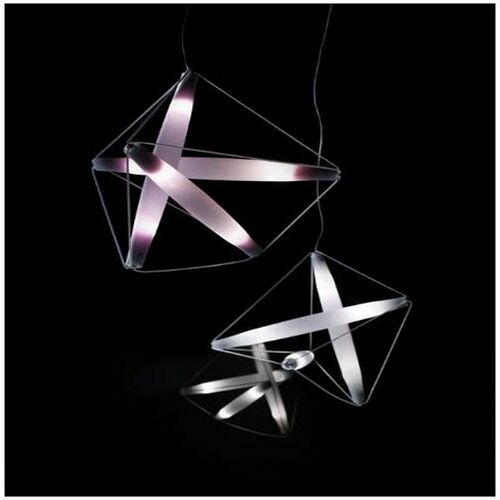 Space Frame Lights by Bartosik." 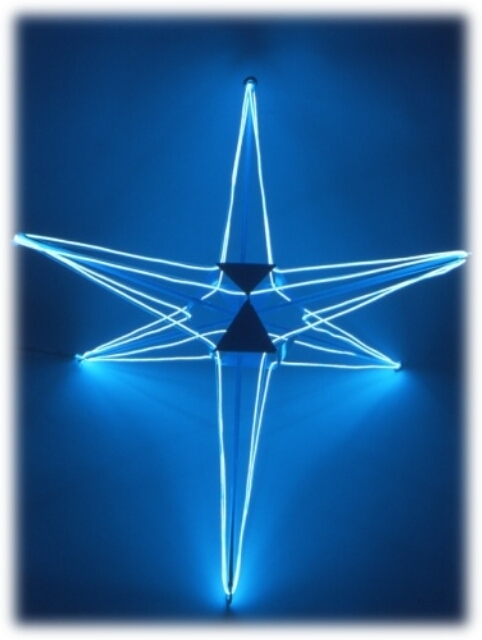 http://www.mmbartosik.com"
James Clar is an artist who has produced many tensegrity light sculptures. Below, his "Cubic Zirconium." For more, see his page or his website. Cubic Zirconia, 17 struts. By James Clar." 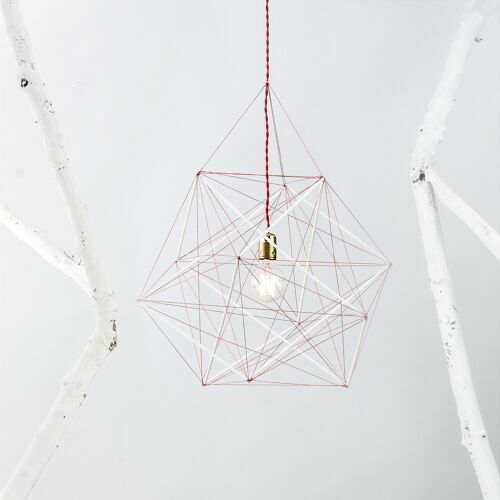 http://www.jamesclar.com"
Nicolas Brevers is a Belgium-based designer who produced a series of tensegrity light fixtures, along with other polyhedral designs. Brevers notes that these forms are harmonious, and often incorporate proportions relating to the golden ratio. 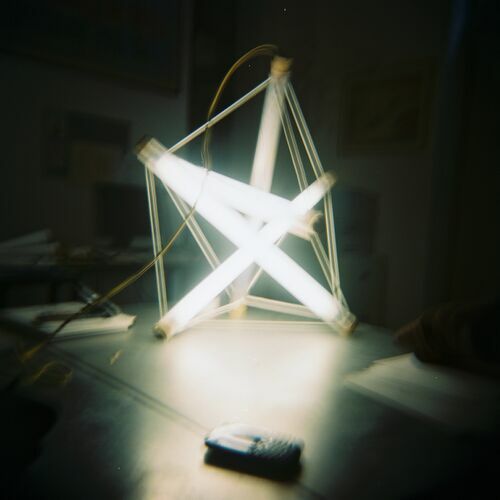 Christian Alexy's student Franziska Luther created a 3x3 strut Fluorescent Light Fixture. Richard Koenig markets a standing 3 strut lamp, with variations on bulb and shade placement. Lamp by Richard Koenig." http://www.koenigdesign.com%20"
The lamp consists of three 700 mm blown glass rods. Connecting wire is covered in white silicone. The lamp is fitted with six energy saving 40 W halogen light bulbs (two for each rod) with a G9 socket (220V and 110V). "3 strut Bucky Lamp by Studio Lagranja, Barcelona.jpg" http://www.furnifurnish.com/furniture/bucky-lamp-pendant-light-for-pallucco-by-lagranjadesign/"
Will Kang of 9999 Pure constructed a lamp from 4 bulbs. 4 strut fluoresecent lamp by 9999pure" http://9999pure.wordpress.com/2010/03/25/chandelier/"
Andrew Senior displayed an electroluminescent cuboctahedron at the Exchange Gallery, White Plains, NY, 16 December 2005-25 January 2006. The show was reviewed in the New York Times on January 1st 2006. 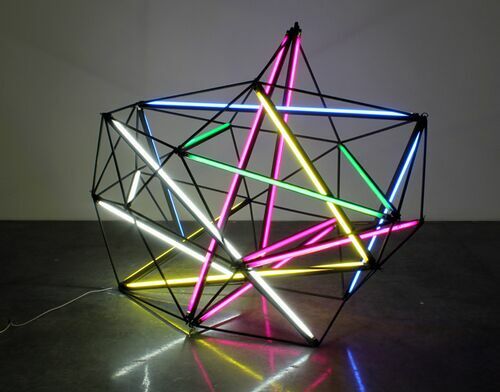 Cuboctahedron welded steel and electroluminescent wire 2005 26 in. 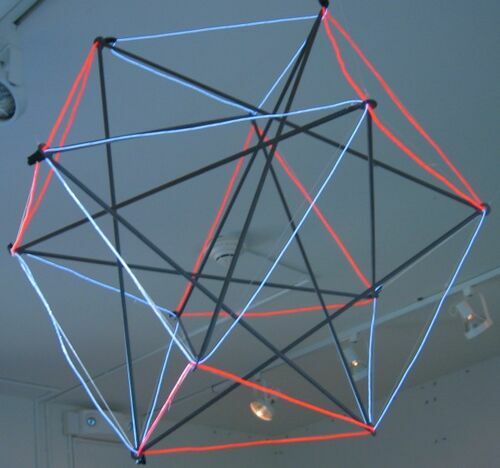 by Andrew Senior" http://www.andrewsenior.com/"
Senior had earlier constructed an electroluminscent tensegrity light. It looks like a nucleated strut, hard to tell from the image. Tensegrity Light, 2002, by Andrew Senior" http://www.andrewsenior.com/"
See Glass for more information on the structural properties of glass. This page was last edited on 28 January 2019, at 12:20.